Entropy is the only quantity in the physical sciences that requires a particular direction for time, sometimes called an arrow of time. As one goes "forward" in time, the second law of thermodynamics says, the entropy of an isolated system will increase. Hence, from one perspective, entropy measurement is a way of distinguishing the past from the future. However in thermodynamic systems that are not closed, entropy can decrease with time: many systems, including living systems, reduce local entropy at the expense of an environmental increase, resulting in a net increase in entropy. Examples of such systems and phenomena include the formation of certain crystals, the workings of a refrigerator and living organisms. Since entropy is the measure of disorder, we can easily create a relative measure of it for any group of people for “equal priority = no priority = chaos = high entropy”, conversely "strong & clear priorities = strong focus = well-defined values-system (strange-attractor) = understandable order = low entropy". This means all we have to to measure the relative entropy of groups, is to undertake an analysis of their value priorities. High group priorities and only a few values will be low entropy and a well focused group. Low group priorities and a large number of shared priorities means high entropy and a low focused group. The group/organisation's only chance of surviving and again becoming successful is to rebuild a robust values-system (strange-attractor)--when this is in place the entropy will again be low. Keeping track of group/organisation's entropy is a way of keeping track of the group/organisation's health. When entropy starts to rise, alarm bells should be ringing. While it's important for an organisation's entropy to be low. For individuals, growth depends on them following a regular entropy cycle as depicted in Figure 2. 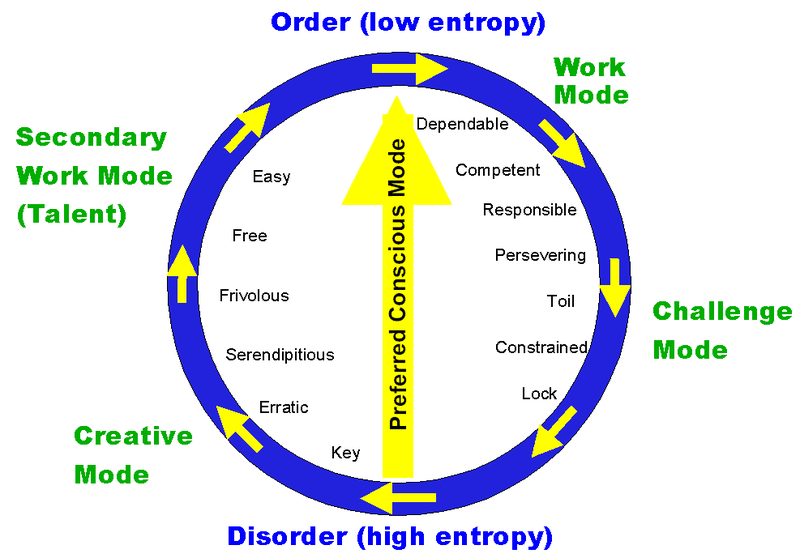 The top of the diagram represents a person working from their primary brain-preference modes. Here they are most competent and dependable. However, if they never engage the other parts of their brain their development will be stunted. It is important that everyone in the organisation is given the freedom and encouragement to undertake fun activities matching their least brain preference on a regular basis 9at least two hours per week). This will unlock their creativity, and lead to holistic brain development--i.e. their brain becomes more complex, and though they are cycling through low to high entropy, in the long run their brain entropy will be decreasing. Hence the paradox, people need to feed off periods of chaotic fun activities (high entropy) in order to be more creative, more sophisticated (low entropy) individuals. In summary, people have to be given their space, time & freedom in organisations so they can have fun in their creative mode—the saying, "All work and no play makes Jack/Jill a dull boy/girl” turns out to be a key principle behind personal development. Mihaly Csikszentmihalyi, in this video, gives a few good examples of people who have this freedom. 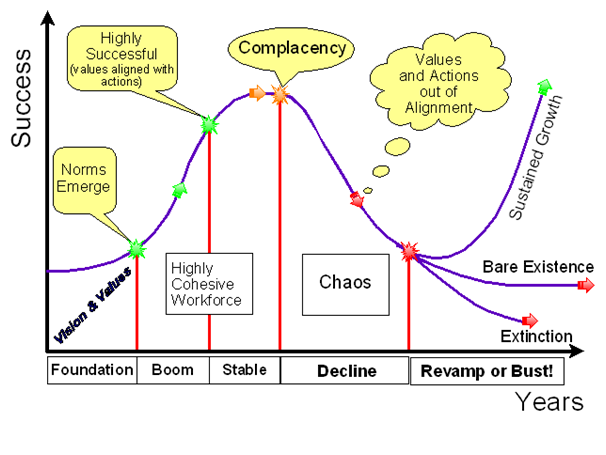 The Australian movie The Dish also gives a good example of an organisation which is maximally effective and successful because its people are continually moving through the entropy cycle. An organisation with a low or zero leisure/pleasure score and a high control/order score would be a low entropy (i.e. orderly and boring) organisation. On the other hand, an organisation with a moderately high leisure/pleasure score and a low control/order score would be an even lower-entropy organisation yet be a fun creative place to work, provided it has a clearly defined values/vision/mission statement based on its people own values, and, encourages teams with a diversity of brain-preference to engage in regular creative mode activities. It has a lower-entropy than the highly controlled no-fun organisation because it is more complex/sophisticated in its operation--you could say, it's more alive! The Chaordic Model (Figure 4), in conjunction with the values alignment model of Figure 5, are designed to create such an organisation. Will. Each person reflects on their foundation and vision values, and brain-preference. Vision values motivate so, "Will this organisation enable you to be passionate about and motivated by your vision values?" Foundation values can demotivate if they are not satisfied so, "Do you have strategies and skills in place that turn these values into a solid foundation rather than an achilles heel?" "In this organisation/group, are you able to focus mainly on tasks which match your work-mode brain-preferences and priority values?" "How do your top 10 values compare to your group/organisation's top 10 values?" "What common ground do you see?" "If your values are markedly different to the group/organisation's values, can you see a way you could happily live your own values whilst at the same contributing to the group/organisation's values?" "How does the group energy management profile compare with your personal profile?" Capability. "Do all in our group have the skills, resources and abilities to live our values in our workplace?" SQ = Spiritual Intelligence, EQ = Emotional Intelligence and IQ = intellectual intelligence, "Do we have the knowledge to develop these intelligences within our group?" The group skills profile indicates the skills needs of each group based on the values they all have. "What are the implications of this profile for our group?" The above program works, and it works very well, because it creates low entropy organisation--i.e. an organisation with a strong values-system (strange attractor) sourced in its people's actual values--self-organisation does the rest. A new page has been added to give an Overview of the MVF. I am in the process of adding a contents page and as part of setting that up am methodically working through all the material at our MVF Knowledge-Base - updating it as appropriate. Please feel free to make suggestions at our feedback page. New pages have been added to our MVF Knowledge-Base Blog. The 128 Values of the Minessence Values Framework now have their own page. The values are listed at https://values-knowledge-base.blogspot.com.au/p/128-values.html and each value is to have its own separate page. Clicking on a value in the 128 Values page will take you to its page. I've started with value 40: Empathy. Over the next few weeks I add a page for each of the other values. Organizational culture is the unique way that an organization forms and defines itself in terms of its shared values, worldviews, principles, traditions, customs, rituals, stories, practices and unwritten rules that distinguish it from other organizations. This includes the ways the organization conducts its business, treats it employees, customers and the community of which it is a part. Its culture affects its productivity, customer service, marketing and advertising practices, HR policies and capacity for innovation. Increasingly, it also includes its environmental and social responsibility practices. Organizational culture is unique for every organization and is one of the hardest things to change. It is influenced by national culture as well. It is also well established that organizational culture is a significant barrier to successful mergers and acquisitions. Most mergers fail due to cultural incompatibilities. A 2015 KPMG study indicates that 83% of merger deals do not boost shareholder returns because of the failure to manage cultural issues. 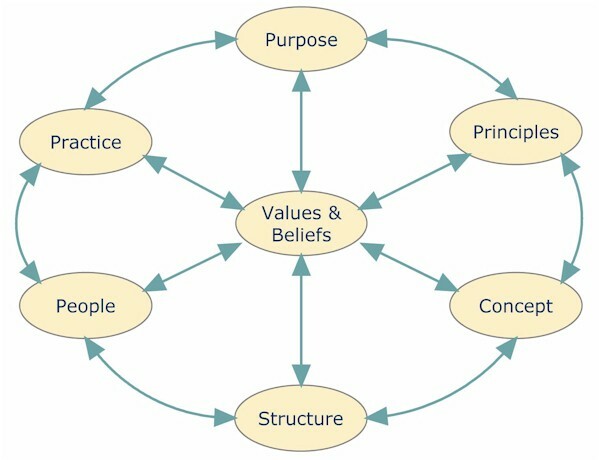 Organizational Culture may be also understood as an emergent property of its Values System and is measured and profiled through analysing how the values combine to work together as Values Tracks or themes that illustrate the shared beliefs about “how things should be done around here”. Each organizational Values Track contains multiple values that are profiled in our Organizational Culture Values Inventory report. This report identifies the primary Values Tracks for a group, team or an entire organization and can help to determine which types and combinations of group values, and their priorities comprise its culture. The chart below illustrates an example of the combination of values and their measured priorities for the Values Tracks of Customer Focus and Learning & Innovation for a senior team within the Minessence International COOP. The diagram below shows three other example Values Tracks which relate the values and beliefs of people in an organization to how they act (Action), how they create organizational structure (Order) and whether they are doing things primarily for their own benefit or to add value to their clients (Share). Values are both primary individual and group motivators. 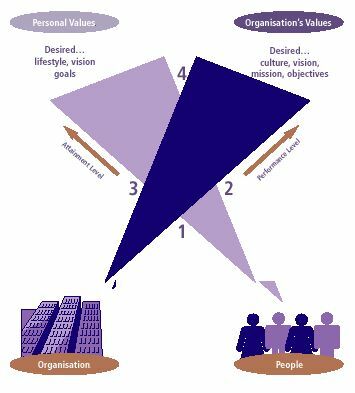 Values Tracks which coalesce within an organization become a collective pattern which motivate group behaviours and can profile organizational culture. These patterns are called Strange Attractors. Strange Attractors create a certain form of order within any complex non-linear system be it the weather, a bushfire, the stock market, societal cultures, an organization, a team or an individual person. For living entities, their values system is their Strange Attractor. Why do we use the term Strange Attractor instead of simply referring to values as attractors? The term Strange Attractor comes from the study of complex systems which exhibit "order within chaos". Chaos Theory and non-linear system researchers discovered that certain entities behaved in strange ways yet their behaviours were obviously being influenced by a strong attraction to something. Attractors which led to entities behaving in strange and not entirely predictable ways became known as Strange Attractors. Attractors which lead to predicable behaviours are termed ordinary attractors. Gravity is an example of an ordinary attractor. With ordinary attractors such as gravity, one can mathematically compute exactly what will happen in the future. For example, if a person drops a ball from 1-meter height, it can be calculated precisely when that ball will land. When an entity's behavior (motion, actions, path, etc.) is governed instead by a Strange Attractor, one cannot predict what will happen in the future, however, one can predict the general form or nature of what will unfold. For example, a person with priority values of achievement, competition, work, financial success, and duty will be attracted by these values to behave in a completely different way to someone who has priority values of expressiveness/freedom, play, intimacy, search/meaning, service, equity/rights. Clearly in both these examples you cannot know what each person will do moment to moment, however, you will know with a fair degree of certainty the general nature of how they will behave as their life unfolds. For each person, their values-system (in its role as a Strange Attractor) gives a sense of order to their life. 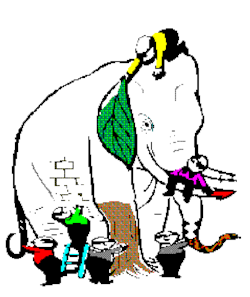 So it is with teams, organizations and different cultural groups. One explanation of the way Strange Attractors work is to consider fish in an ocean. As the water moves in synchronism with the current or swell, the fish all appear to move together from side to side or up and down as though connected by some invisible connector-- of course, we know that it is the water of the ocean. A similar phenomenon is seen in flight patterns of birds. Strange Attractors behave the same way: we cannot see them and they (unlike the water of the ocean) have no material substance, yet, they link all material objects. In Newtonian Physics physical reality is considered to be solely a material reality. The existence of Strange Attractors has caused us to change our notion of reality since no one will dispute that they are real, but they have no material substance. This is a working assumption of Quantum Physics. Translated into our understanding of modern organizations, we can differentiate a Newtonian Science Organization from a Quantum Science Organization. An organization is a collection of choices looking for problems, issues and feelings looking for decision situations in which they might be aired, solutions looking for issues to which there might be an answer, and decision makers looking for work. Organizational order is provided through motivational energy ordered by Strange Attractors. Order is thus created and maintained through conceptual controls–people's values, ideas and beliefs are creating the order, not some manager with authority. The strongest motivational energy emanates from shared meaning–the source of the organization’s values-system–the Strange Attractors which create and maintains its culture. 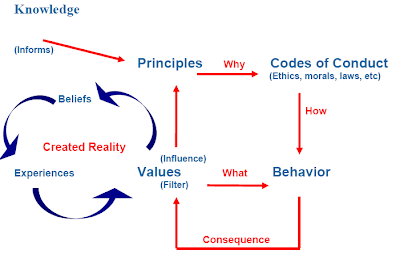 The following diagram illustrates the pattern of Values Tracks (motivational energy) which emerges from the coalescence of values priorities of a senior team within our own Minessence International COOP organization.